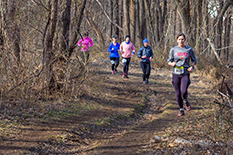 At a 50-kilometer ultramarathon Saturday in Howard County, Assistant Professor of Kinesiology Steven Prior (below) and research partners conducted tests to determine the effects of ultra-endurance sports on the cardiovascular and muscular systems. Trying to run 50 kilometers on a cold Saturday morning would be traumatic for most people. At first glance, even the extravagantly fit entrants in an ultramarathon this weekend in Howard County seemed to need urgent care. Mud-splattered and with trickles of blood here and there, they slumped or sprawled around a field hospital-like tent where a dozen or more people scurried to conduct various medical assessments on them. But then, after 10 or 15 minutes of ministrations, each contestant stood up and loped away, quickly disappearing around a bend at Rockburn Branch Park. The scene in the tent would repeat over and over throughout the morning and early afternoon for 11 runners who’d good-naturedly agreed to be poked and prodded every 10-kilometer lap. It’s part of what may be the first study of the effect of ultramarathoning—which has risen precipitously in popularity—on various mechanisms of the body, particularly in comparison to frequently studied shorter races. Prior said the tests after the first lap would provide data reflecting a moderate run, while the later ones would show how higher levels of exercise affect the body. A follow-up battery of tests were run yesterday to see how the body recovers. He is conducting the study with partners Rian Landers-Ramos Ph.D. ’15, an assistant professor of exercise science at Towson University, and Odessa Addison, an assistant professor of physical therapy and rehabilitation science at the University of Maryland School of Medicine. Other Department of Kinesiology faculty members, including Assistant Professor Sushant Ranadive and Professor James Hagberg, and eight graduate and undergraduate students attended the race to help conduct the research. Results are months away at least, and the researchers are eyeing much more extreme races. “We’re thinking of this a test run for our dream, which is a 100-mile race,” Landers-Ramos said.